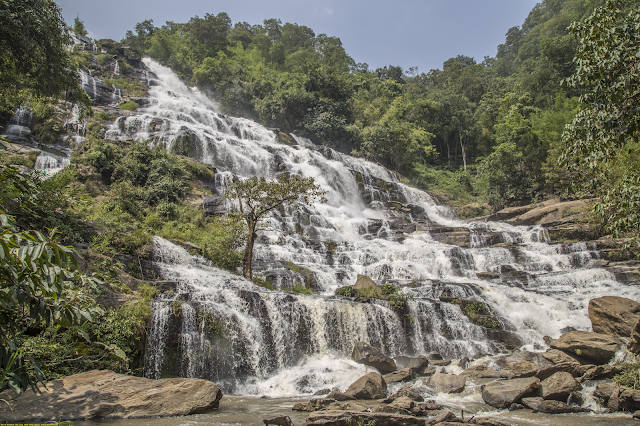 Mae Ya Waterfall was definitely one of the better waterfalls you can see in Thailand, and it seemed to us to be the pride of the Chiang Mai province. It certainly surprised with its enormous size, which local people said was about 260m tall and up to 100m wide (though its look like that its height was more like 40m). A ten minute walk leads one from the parking area along a concrete walkway to the falls. There are vendors in the parking lot and rest rooms near the falls. Although it is possible to play in the pools formed by the river, bear in mind that it is slippery. Photographers, bring a very wide lens, 24 mm will not get the whole waterfall.